When people ask me what I paint, I simply say "I paint rocks." But, in fact, free-form arrangements of granite boulders, mineral-colored sandstone surfaces, rock-strewn tide pools, and pebbles scattered across ocean-washed stone ledges take center stage in my paintings. Recent works such as Adornment (upper left image), Crosscurrents, Dual Sandstone Impressions, Jetty, Weathered Patina provide magnified views of surface details. This enlarging process reveals a range of tiny "hidden landscapes" embedded within the rock surface while also allowing the composition to fluctuate between realism and abstraction. 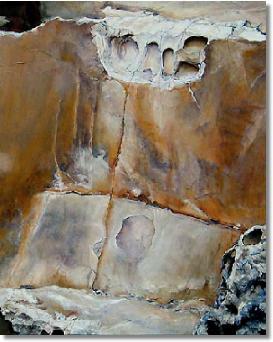 As the series progressed, so did my interest in learning about the various types of rock formations I was painting. In particular, tafoni--those amazing sandstone segments embellished with weathered patterns of pits and cavities--play a significant role in my work. This type of fretwork brings to mind the labyrinthine configurations of vintage lace. Tafoni are featured in a number of paintings such as Diadem, Free-Form, Procession, Tafoni Detail, and Tafoni Medallion (lower left image). In the process of researching tafoni, I found Dr. Jonathan Boxerman's website at www.tafoni.com to be very helpful. 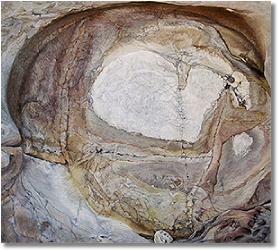 There you will find a wealth of geological information about tafoni--their weathering processes, origins, and evolution, along with, of course, many tafoni examples. Copyright © 2019 Rosalie Lang. All rights reserved. Unauthorized use prohibited.